Need replacement cushions for a outdoor patio set you purchased from Walmart? 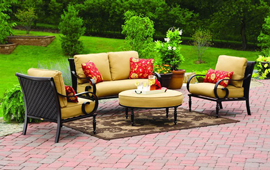 We sell factory direct replacements for ALL patio collections with dozens of fabric selections to choose from. Our factory is located in Central Florida, providing you with a quality replacement cushion manufactured here in the USA! 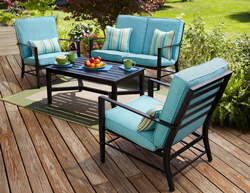 To find your set including popular sets from Better Homes and Gardens, Hometrends and Mainstays from the Walmart Outdoor Furniture line, and to view our clearance sale prices please select the “Replacement Cushions” tab in the menu bar. Can’t find cushions for your discontinued Walmart Patio Collection? Do you own an outdoor Walmart patio furniture collection that is discontinued preventing you from buying or even being able to find a cushion replacement option? Our factory not only makes replacement furniture cushions for outdoor Walmart collections, we provide a large selection of fabrics to choose from at a factory direct price. With over 35 years in the business, we make quality outdoor cushions for discontinued, and current Walmart furniture sets right here in the U.S.A. from the highest quality fabrics and materials with trained professionals. Most Walmart collections including the Better Homes and Gardens and Mainstays collections are seasonal and are made overseas, leaving you out of luck when looking for a replacement cushion. We are one of the largest cushion manufactures in the United States, offering you that quality cushion set for your patio set that may still have life in it due to the quality and durability of the frame, but cushions that may be faded or ripping sooner than you expected. Offering cushions for ALL sets in dozens of outdoor fabrics! Although most discontinued and older sets are pictured on the website that we have cushions for, some may not be posted. WE OFFER CUSHIONS FOR ALL Walmart patio furniture sets so do not hesitate to contact us with your set name or picture. If you do not see a set that you need replacement cushions for we can make it. Lastly, many of fabrics that came with the furniture are discontinued and were made overseas, which we do not carry but we offer dozens of higher quality fabrics for you to choose from and offer samples to be sent out upon request. products or Walmart original designs. ReplacementCushionStore.com is a company that produces after-market replacement cushions to fit specific Walmart Furniture styles.